Sailor Yama-Dori is a widely loved teal ink famed for its shading and sheen. When searching for a teal ink recommendations usually point to Sailor Yama-Dori. I have a couple of teal inks that I enjoy so I haven’t really needed to try an alternative. Strangely hearing so much praise for Yama-Dori put me off a little. The high expectations I had probably wouldn’t meet the hype. This is where sample inks are perfect. If you’re disappointed you haven’t wasted money. Therefore with little risk, and as I was ordering other samples, I thought it was the perfect time to give this ink a test run. I have been using this ink in my broad nib TWSBI 580. A broad nib gives me a great view of the ink showing off its shading and sheen. The shading is good. The teal tones from this Sailor ink give you some real variances in the depth of the colour on the page. The colour is very pretty with the light shades looking really quite green. And then there is that red sheen that shines on the page. That’s what really makes this ink colour pop. When you look at the ink in the light you see another element of the ink that is striking and very pretty. Like the other Sailor inks I have used in this mini series the flow of this ink is great. It’s smooth on the page, wet and feels dreamy to write with. I have enjoyed this ink more than I expected, the hype is totally justified. 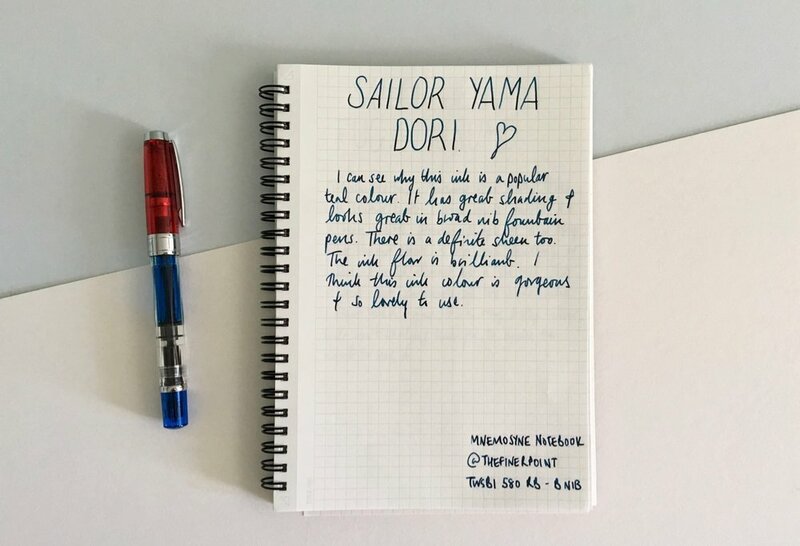 Anyone who enjoys dark inks, or teal inks or fun and quirky inks will really get a kick out of Sailor Yama-Dori. What this mini series has taught me is that Sailor has some great quality inks. Some of the colours perform better than others and have more to show off to the customer. The hype around some of their ink colours is completely justified. I enjoyed the Blue Black ink so much I snapped up a bottle and this has become an ink I use regularly. Now if only Sailor expanded heir offering in the UK and Europe and offer their full range of Jentle inks.